SUMMARY: The patient-centered medical home can deliver quality care at little or no added cost while improving patient and provider satisfaction. 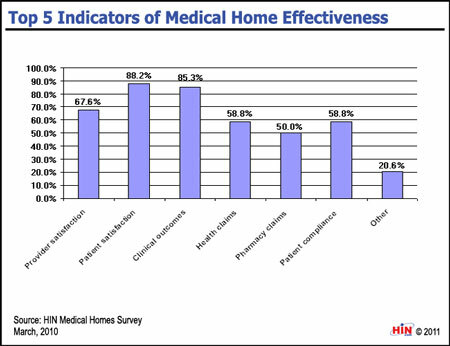 We wanted to see which metrics organizations evaluate to measure the effectiveness of the medical home. The Healthcare Intelligence Network Medical Homes in 2010 e-survey captured the dynamics of the PCMH experience for more than 156 healthcare organizations. 2010 Medical Home Performance Benchmarks: Adoption, Utilization and Results is the Healthcare Intelligence Network's second annual analysis of awareness, adoption, tools, technologies, challenges, benefits and outcomes of the PCMH model of care. This exclusive 65-page report analyzes the responses of 156 healthcare organizations to HIN's fourth annual Industry Survey on the PCMH Model, administered in March 2010. It updates metrics and measures on current and planned PCMH initiatives  including the emerging trend of the embedded case manager  as well as lessons learned and results from living PCMHs. 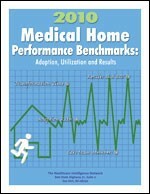 2010 Medical Home Performance Benchmarks: Adoption, Utilization and Results is available from the Healthcare Intelligence Network for $341.80 by visiting our Online Bookstore or by calling toll-free (888) 446-3530.